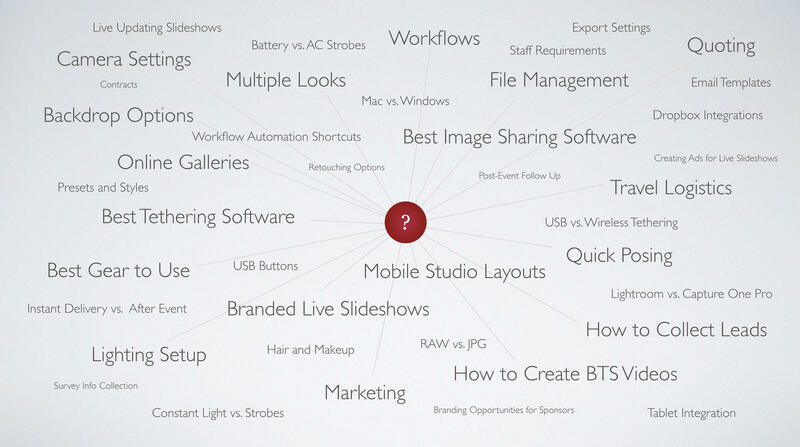 Tools, training and community for headshot photographers who want to grow their business. Quoting and delivering hundreds of headshots for conferences, trade shows, and large companies can be intimidating. What software is best? What workflow will keep me organized? How can I deliver the images instantly? How can I create a valuable branded experience for my client? Headshot Method will give you all the tools and training you need to get started right away! AND your clients will be thrilled with the results! Set yourself apart from other headshot photographers and offer the best high-volume event headshot experience with confidence! We have taken our years of experience serving some of the biggest brands and distilled it into usable and valuable information and resources to guide you to success. Through concise videos and articles, we'll walk you through every process so you can easily understand how to deliver outstanding experiences to your clients. Members get access to our private Facebook group where we share our setups, network with other photographers and grow as a community. Learn how to clarify your message and create content and marketing material that attracts your ideal client. Make your images pop right out of the box. When you’re serving hundreds or thousands of people at events, there’s no time to fiddle around. Use our presents for images that look instantly polished. How do I instantly deliver headshots? What are the best camera and lighting settings? How do I price jobs? How do I show only my best images in a curated slideshow with branding for my client? How do I collect leads for my client? How many headshots can I deliver each hour? We are launching soon and we want you to be part of the family. Q: Why should I become a Headshot Method member? A: Many photographers are unsure how to deliver hundreds of headshots for events and big brands. They pass up great opportunities or underprice and underdeliver on others. Headshot Method was created to coach photographers through every step: marketing, quoting, and executing a valuable headshot experience. With the business and technical challenges solved, photographers can grow a profitable event headshot business with confidence. Q: When will I get access to Headshot Method training courses? A: When you become a Headshot Method member, you’ll enjoy access to every subject, article, and video instantly. Jump to specific topics you’re most interested in, or start at the beginning. It’s up to you! Q: Who is behind Headshot Method? A: The team at One Tree Studio runs Headshot Method. After providing consulting for various photographers across North America, the team realized just how many headshot photographers would benefit from a one-stop-shop for training and resources for world-class event headshots. Q: What if I have specific questions? A: Headshot Method members have access to our private Facebook Group, where our community photographers can share what they have learned. You can also book one-on-one coaching with the Headshot Method team. Q: What is different about Headshot Method compared to other educational sites? A: We created Headshot Method because frankly, it didn’t exist yet. When our studio started offering high volume, instantly delivered, professional headshots with branded emails and curated slideshows - there was next to no information for us to learn from. In fact, we couldn’t find any other studio that offered the exact set of features we wanted to offer. There wasn't (and still isn’t) one piece of software that does everything we need. So we contacted developers, requested features, wrote some of our own scripts and workflows and figured out the business side of creating outstanding, and profitable experiences for our clients. Simply put, there isn’t anywhere on the internet (trust us, we have searched high and low) that puts together technical and business resources to help you respond immediately to these lucrative opportunities. Q: When will Headshot Method Launch? A: Headshot Method will be launching in early 2019. If you want to be the first to know when we launch, please be sure to sign up to our newsletter! Headshot Method's first course launches soon, and we want you to be part of this journey. Subscribe to get the updates.